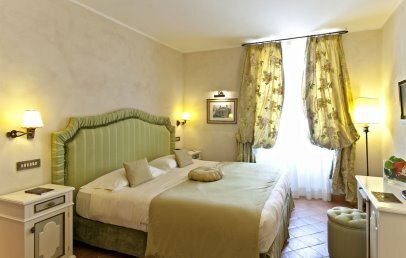 VOI Donna Camilla Savelli Hotel is in Rome in the district of Trastevere. Its position, via Garibaldi at the foot of Gianicolo Hill, will allow you to comfortably walk to many charming points of interest like Piazza Navona, Campo dei Fiori, Lungo Tevere, Vatican City, the Gianicolo Hill and the Capitolini Museums. 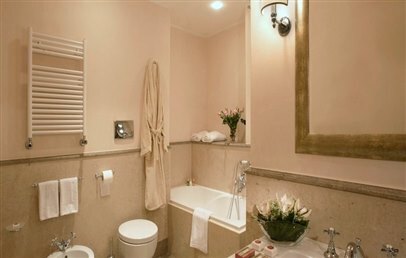 VOI Donna Camilla Savelli Hotel is easy to be reached from the two main airports of Rome: Ciampino 20 km, Leonardo da Vinci Fiumicino 26 km. Built from a monastery of the early 1600, designed by Francesco Borromini, the elegant and refined Hotel VOI Donna Camilla Savelli offers to its guests 89 rooms and 10 suites, a breakfast room and lounge bar, a meeting room and a courtyard-garden which is the ideal place for receptions and private parties. The Hotel also features panoramic terraces with views over Rome, an exclusive location used also for gala dinners. 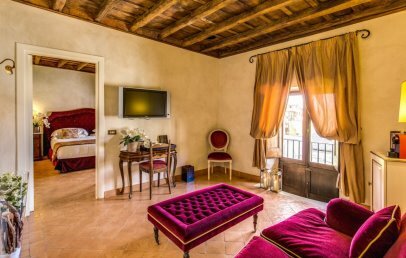 The 89 rooms and 10 suites of the VOI Donna Camilla have exposed timbers and fine stucco that create an elegant and sober style. No matter what kind of room you will choose, all of them have bathroom, minibar, air conditioning, pay per view TV, safety box and complimentary Wi-Fi connection. At the VOI Donna Camilla Savelli Hotel, equipped with elevator and accessible to wheelchairs, there are also rooms and dedicated services for disabled people. Classic – approx. 15-18 sq.m., new rooms in the new wing. Superior – obtained from the cells, that once were used by nuns, double or twin bedded. Executive – approx. 15-18 sq.m., obtained from the cells, that once were used by nuns, double or twin bedded, many rooms with garden view or view over the rooftops of Trastevere. Suite – approx. 20 sq.m., the most spacious accommodations, located in the most quiet area of the hotel, bedroom and living room, luxury services. The hotel offers to its guests an American breakfast as well as a Vegan Delights Corner during the breakfast buffet. The Concierge service will be at your disposal to recommend the best restaurants in Rome. The VOI Donna Camilla Savelli Hotel offers a complimentary Wi-Fi connection throughout the hotel. On request are: porter service, meeting rooms and spaces for receptions, laundry and alarm service, private parking on charge (limited parking lot). City tax - The municipality of Rome charges a tourist tax to be paid at the hotel (the tax doesn't apply to children under the age of 10). They are located in the new wing of the convent and are newly built. 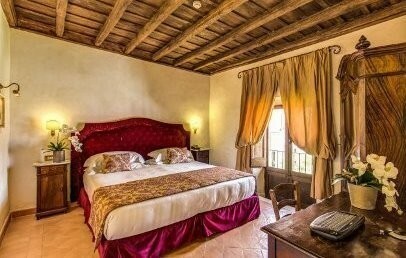 They are furnished with a four-poster bed. The air-conditioned rooms are equipped with an LCD satellite TV, pay-per-view channels, safety box, hair dryer, ETRO courtesy set, tub or shower, minibar. 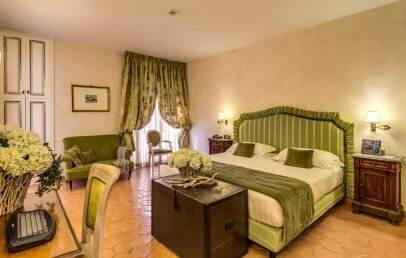 Within the Classic Room area, there is the Lounge Lifestyle and daily at scheduled times, guests can enjoy complimentary small snacks in a real nice setting overlooking the rooftops of Trastevere. Also these rooms are obtained from cells that were once used by nuns and most of them have a view over the garden or the rooftops of Trastevere. 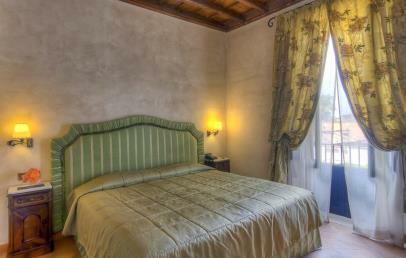 A relaxing atmosphere with antique furniture, exposed wooden beams, decorated with light colours and luxurious details. 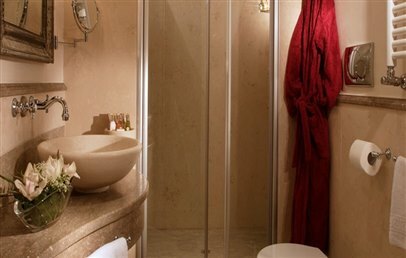 The marble bathroom has a tub or shower, hair dryer, bathrobe, slippers, ETRO courtesy set. They offer all air conditioning, safety box, LCD satellite TV, pay-per-view channels, minibar. 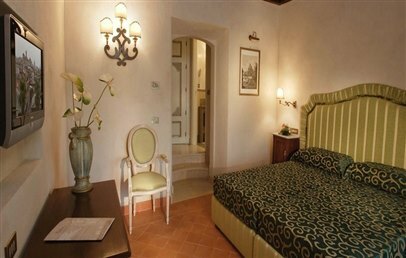 Spacious Suites located in the most quiet area of the Hotel. They are composed by a bedroom, separated living room and bathroom with tub or shower, hair dryer, bathrobe, slippers, ETRO courtesy set. The Suite is air conditioned, has safety box, LCD satellite TV, pay-per-view channels, cotto flooring, kettle, coffee machine, minibar. 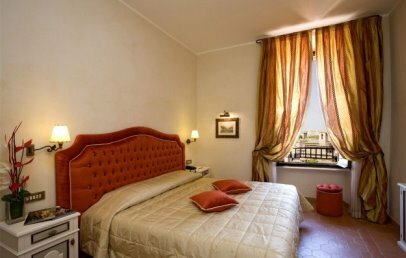 In addition to standard comforts it offers newspaper in the room, luxury services and a copy of the guide of the Hotel Donna Camilla Savelli about Trastevere. The rooms are obtained from cells that were once used by nuns. The quiet and romantic atmosphere of the rooms is characterized by "noble" colors such as brown, ivory white and green and with terracotto flooring. The bathroom has tub or shower, hair dryer, bathrobe, slippers. They offer safety box, air conditioning, pay per view TV, mini bar. Max. occupancy of 3 adults or 2 adults + 1 child.